Sometimes in Iceland the land changes or the weather becomes unruly and we have to execute a “plan b” route during our amazing Iceland wedding days. 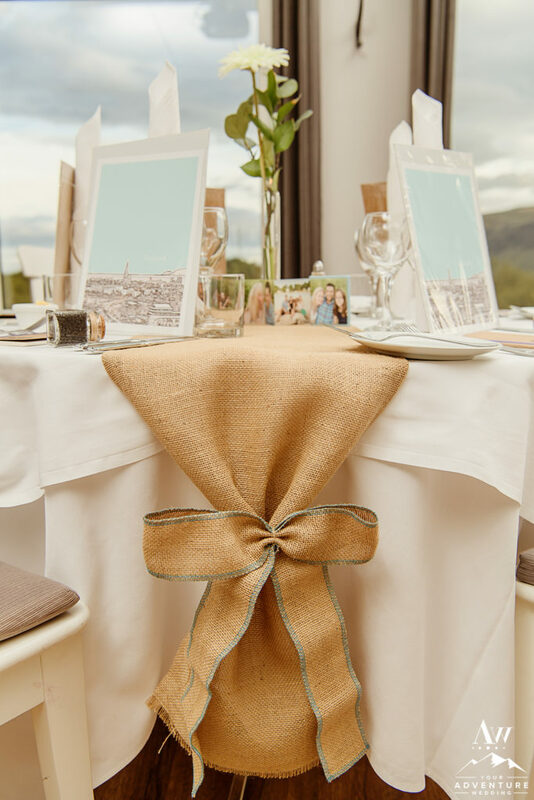 This was the case for the fabulous summer wedding of Amy and Israel. 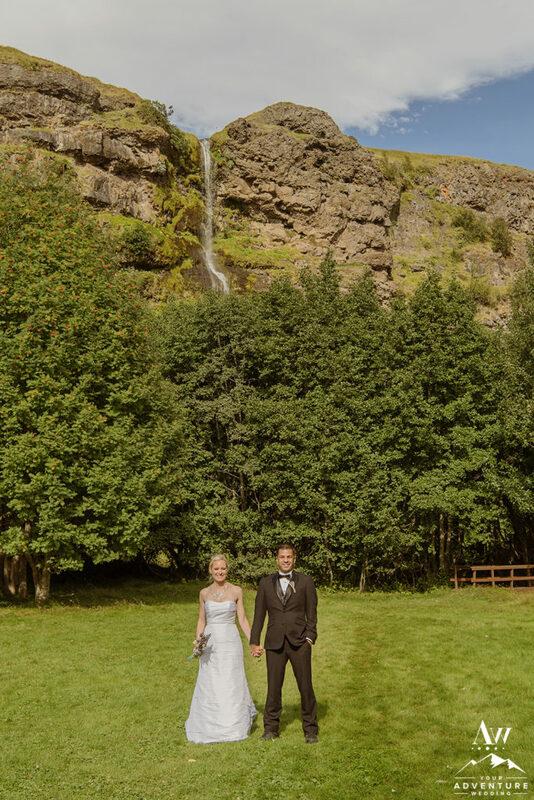 The original plan was for them to hold their Iceland wedding ceremony in an ice cave area, but the country ended up having one of the warmest summers on record which made the ice cave area we planned to go to, unstable. So enter in “plan b!” Not to worry though, having an Iceland wedding with super jeeps as the mode of transport allows us to change plans on the drop of a dime. Plus, often times the “plan b” route proves to be the better than the original, which was indeed the case! So, let’s go darlings and be adventurers! Amy and Israel’s whimsical wedding day in Iceland began at one of my favorite hotels… Hotel Grimsborgir in Selfoss. 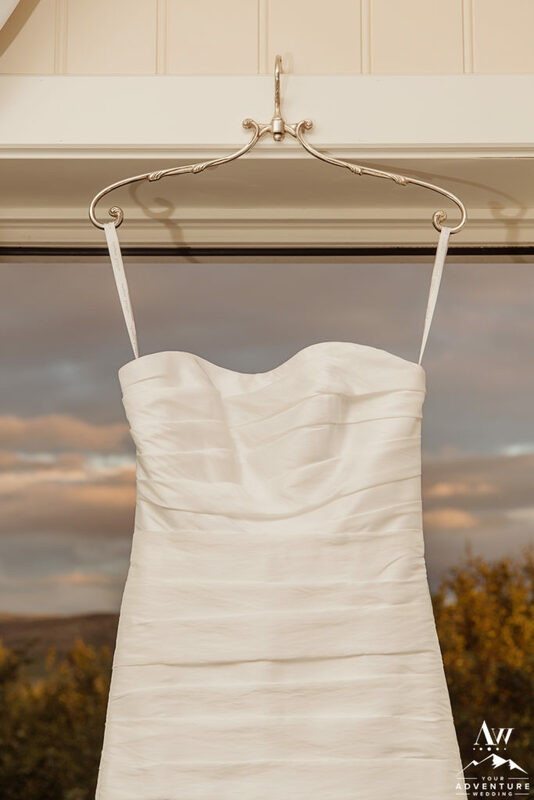 The ladies got ready together in one of the luxurious bridal suites early that morning. How pretty is her Iceland wedding dress and boots? 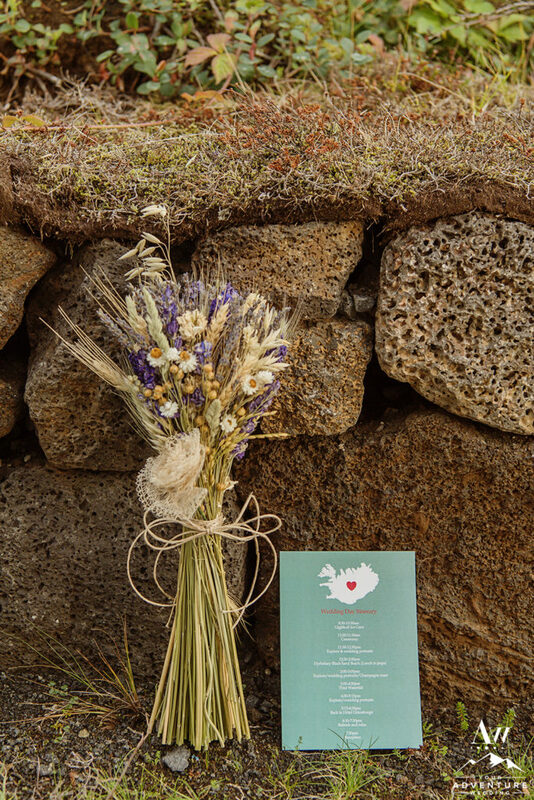 Seriously perfect details for an adventure wedding in Iceland! As soon as 8:30am came (yes our awesome wedding begin super awesomely early!) their 40 guests loading into super jeeps for a full day adventure wedding day. 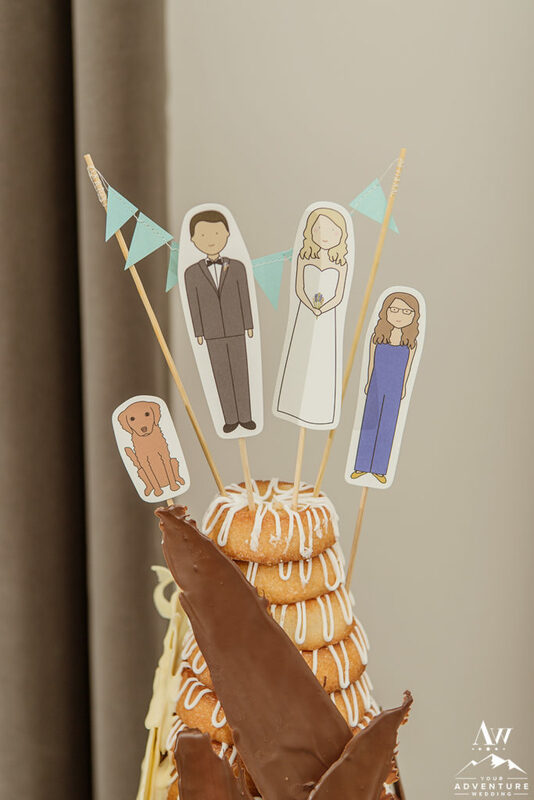 Their guests had no idea where the ceremony spot would be and you could feel the excitement in the air! 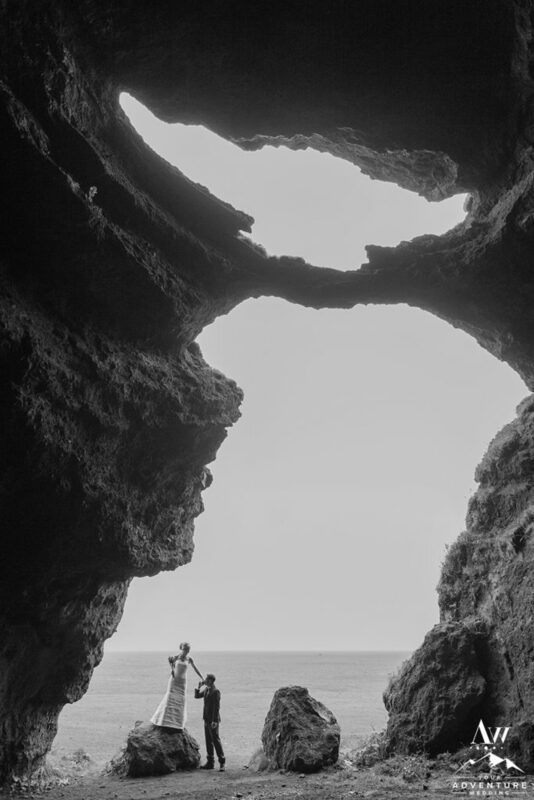 To their surprise, they were taken to a beautiful secret cave in the middle of a black sand desert. 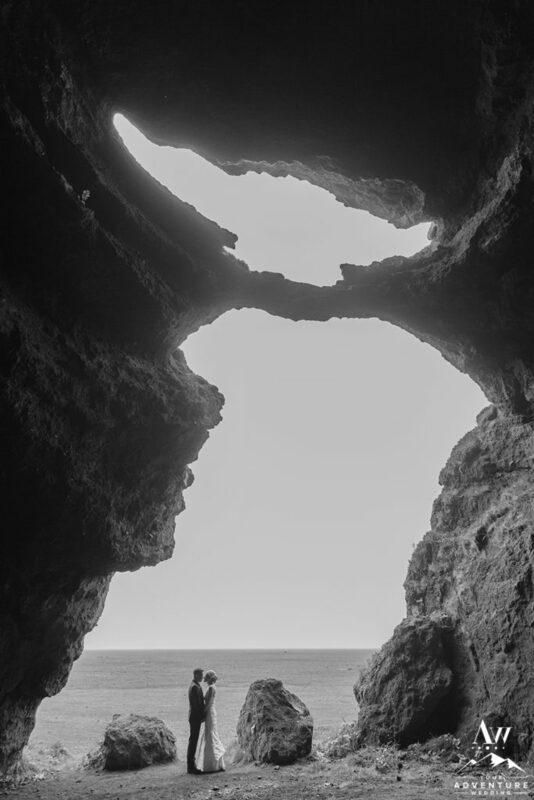 When they jumped out of the jeeps and walked into the cave they were speechless. 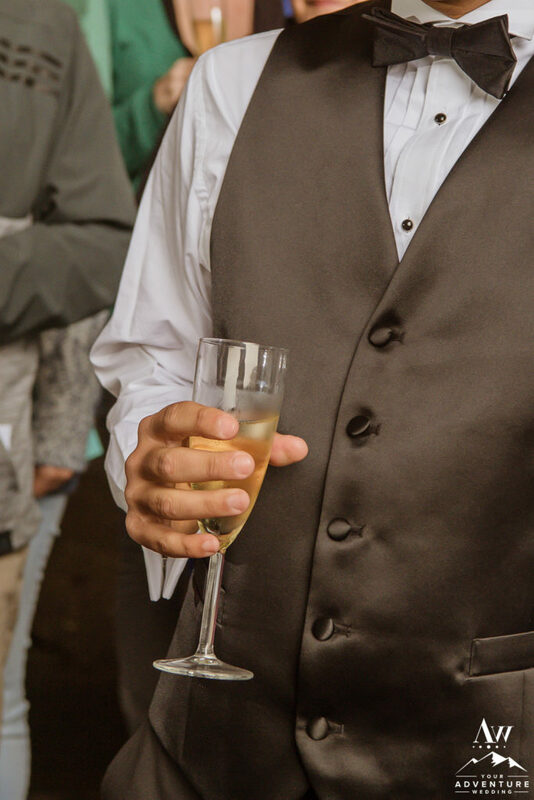 There were chairs perfectly lined, lanterns, fancy fruit and chocolate display along with a gorgeous champagne toast! 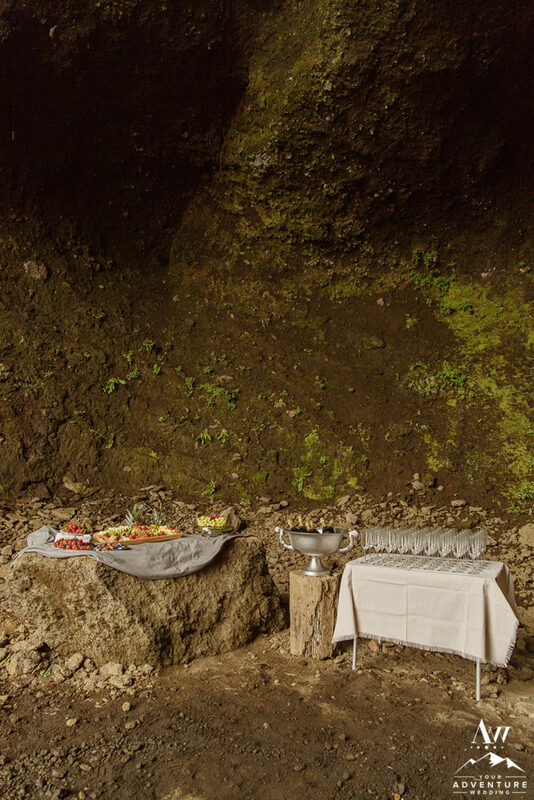 We loved putting together this amazingly delicious champagne toast and fruit spread for everyone to delight and celebrate in after the Iceland cave wedding ceremony they had! The next stunning spot the Iceland adventure wedding day agenda was a perfectly private black sand beach where they frolicked in the rain together until it went sideways. 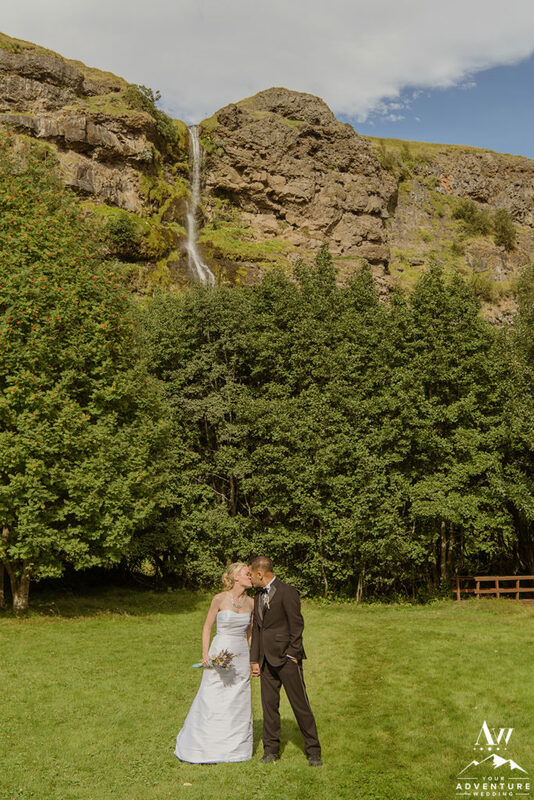 But you know what is amazing about rainy weddings in Iceland…. They are not only LUCKY but always bring incredible show of end to end rainbows! 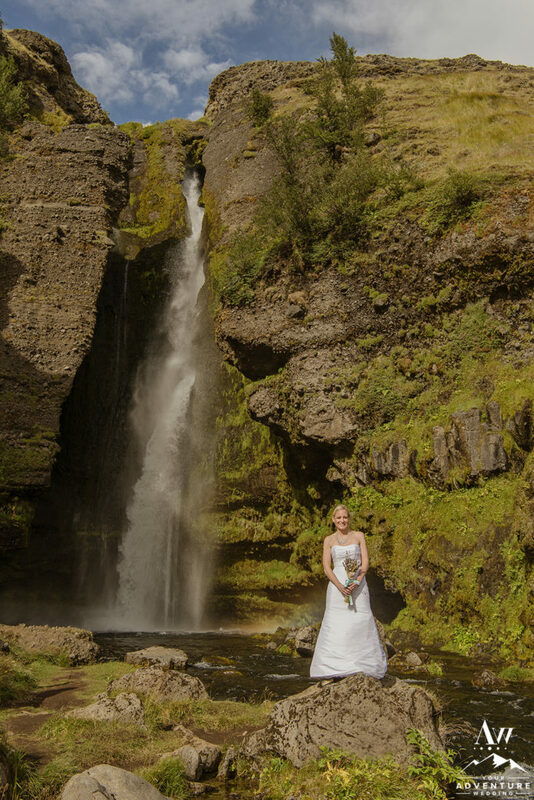 A wedding in Iceland, would not be complete without a waterfall along the path of our adventure! 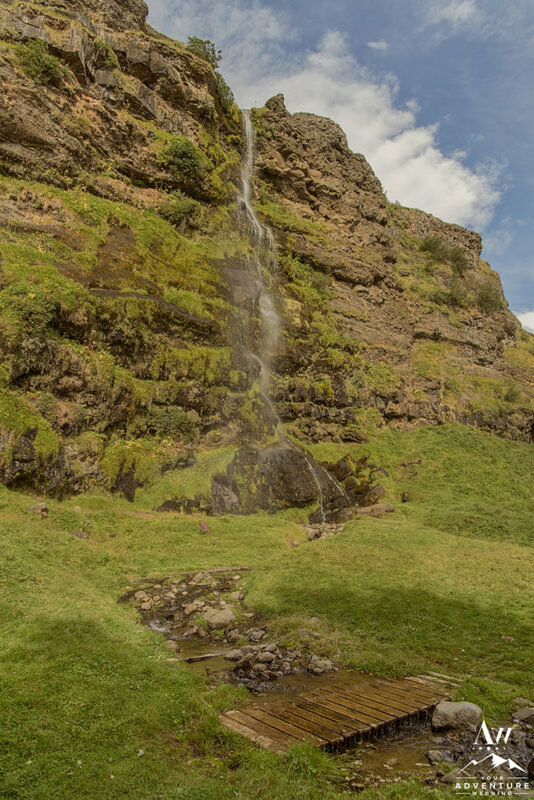 But we got lucky… as several offbeat waterfalls followed along this gorgeous day’s route, each varied in shape, size, tone, and texture! The evening brought a beautiful Iceland wedding reception that was sweetly styled with rustic local elements. 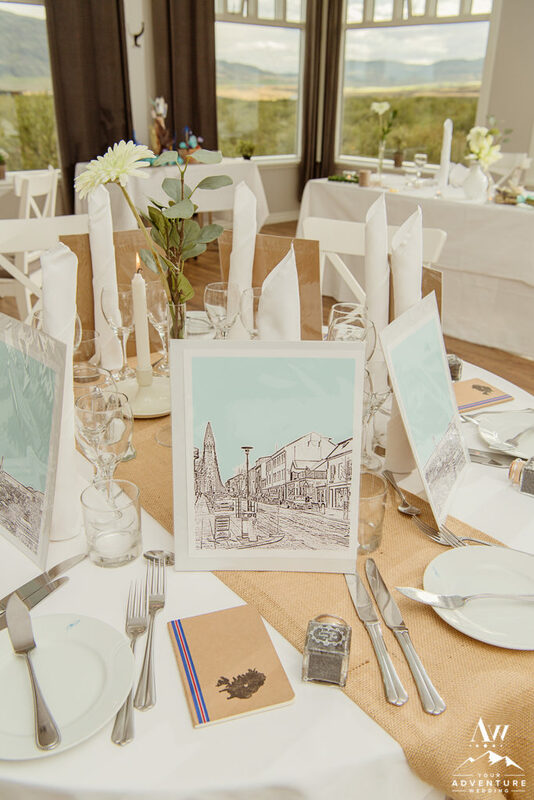 Each guest was given a local artist’s drawing of an area within Reykjavik, lava salts, and journal notebook. How crazy sweet is that? 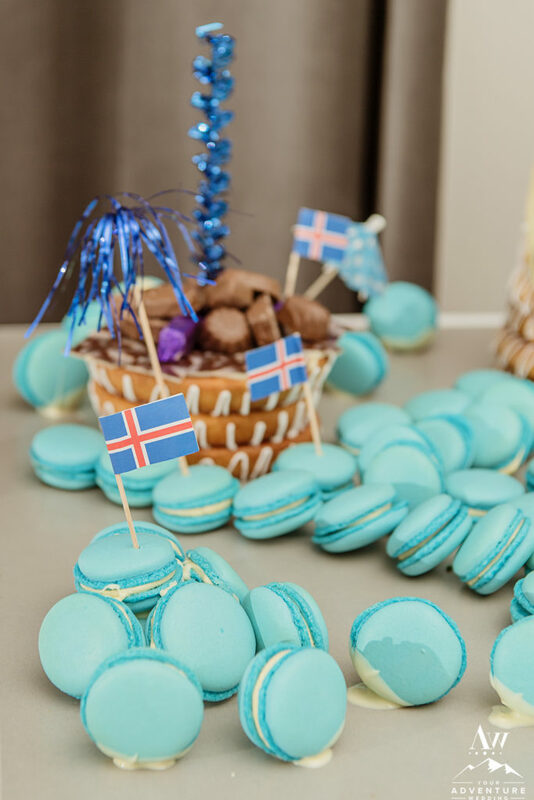 Not to mention everyone delighted in a lovely 4 course meal complete with a traditional Icelandic wedding cake and blue macaroons! Delicious! We wish these two more laughs, smiles, and adventures than they can handle in a lifetime together! 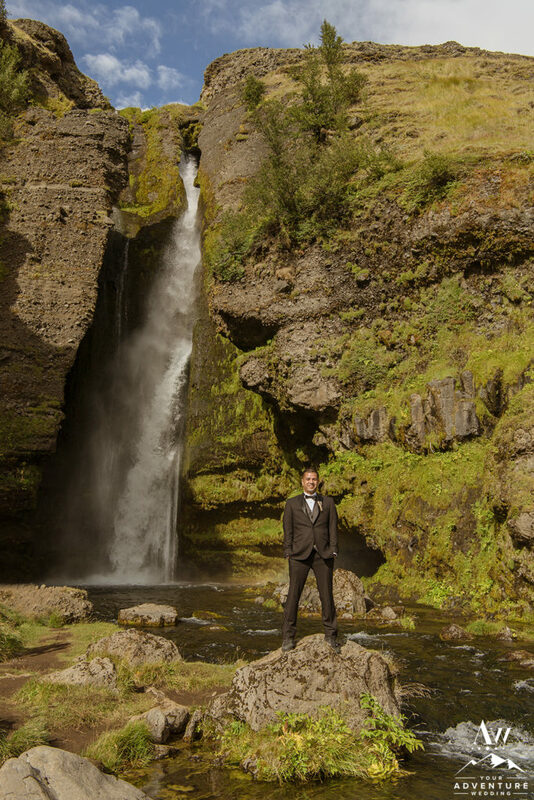 Thank you for choosing us to not only plan but photograph your amazing adventure wedding in Iceland! ? ? ?